"Welcome to Watertown" FIREBALL RUN Northern Exposure! Fire Magick makes an appearance to welcome the FireBall Run contestants to Watertown towards the end of this episode! Episode: Welcome to Watertown. Things happen to the BeOnAir Team. An entire town is stuffed inside an arcade. Frank and Ruth sweep the floor with the Spin Doctors. Team Hot Water finds the golden arches just in time to meet Napoleon. Then a seriously EPIC city welcome on a Tuesday lifts everybody's spirit. Local Troupe Dances With Fire: Story by Channel 7 News. Watertown, NY. The North Country Arts Council wants to introduce children and their families to a broad spectrum of the arts. Hoop and poi dancing is all about skill, balance and losing yourself in the flow. 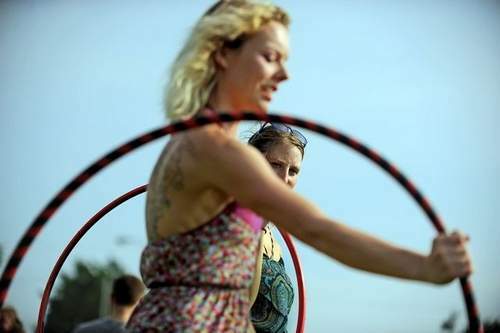 At Thompson Park on Sunday, fire and hoop dancers with Fire Magick, a professional performance group in Watertown, were showing kids and grown-ups how to play around with hula hoops and poi spinning in an open “flow jam” session. “The objective of poi dancing is to lose your thoughts and to flow,” said Adam Lobo, a veteran fire dancer from Australia who was playing with a pair of poi, swinging tethered weights in patterns to create visual illusions. Gathered around the team of artists and their novices Sunday were dozens of admirers and children who were learning new tricks in the free event. The group eventually hopes to teach people fire tricks if the city of Watertown supports it. Practicing a hula hoop transfer — from one hand to the other — Sunday evening was 15-year-old Isabel Koapke-Allen of Watertown. She said she usually prefers being indoors but came out Sunday to learn hoop dancing. Mr. Lobo said part of his mission is to get kids outside to play, “level up their character” and integrate them into a larger community through dancing. Mr. Lobo, who is a well-known booking agent in the business, also is helping them with promotions. Mr. Hill said he likes to think that he is teaching people how to paint with their bodies, with each move representing a color. The group’s next performance is on Friday in Syracuse during the fireworks celebration. Fire Magick also will be participating in the coming Piyak Paddle Fest on July 3 in Clayton.